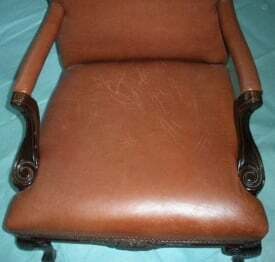 One of the most common problems with leather furniture is scratching. Fortunately, surface scratches on leather are pretty easy to take care of. Most leather furniture is made of fully-finished leather that does not scratch easily. It has a surface coating that prevents the type of minor surface scratches that are so often a problem on less durable types of leather, like semi-aniline or aniline. If you experience minor scratching on your aniline leather, use the following information to remedy the problem. If your fully-finished or semi-aniline leather has been scratched, it is likely scratched too deeply for this method to be effective, and you may need to call a professional. 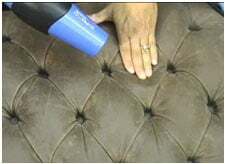 Turn on the hair dryer and use it to warm the surface of the leather where the scratch is. Use your hands to gently massage the leather. This should bring the dyes installed at the tannery back to the surface and reduce the appearance of the surface scratch. Be careful not to get the leather too hot though, or you might burn it! Let the heat on your hand be the judge – if your hand gets uncomfortably hot, it’s too hot for the leather. Will the heat hurt leather? You’ll find some sources say using heat on leather will bake and ruin it, and, in part, they are correct – too much heat will damage leather, absolutely. But keep in mind, heat can be good in small doses. Leather is every bit as strong as human skin, and you shouldn’t have any problems with heat damage as long as you use the hand test described above. If the scratch is severe, this technique may not do the trick. In the event that heat and massage fail to eliminate the scratch, you’ll need to call in a professional. Additional questions or concerns? If you leave them in the comments, we will get back to you.